"41CE12-195" by Timothy K. Perttula and Robert Z. Selden Jr.
DECORATION (INCLUDING MOTIF AND ELEMENTS WHEN APPARENT): The rim has four horizontal engraved lines with downward-pointing excised tick marks. 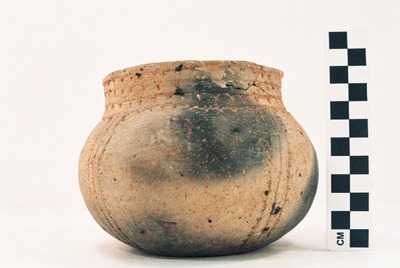 The vessel body has four sets of three closely-spaced diagonal engraved lines that extend from the rim to the base. The two outer engraved lines have outward-pointing excised tick marks on them.